When Sandra Laronde wants to make something happen, she knows how to go for it. As founder of Native Women in the Arts, she’s published anthologies and produced Aboriginal women artists. As an actor, she’s appeared in many plays authored by Aboriginal writers. Now as the artistic director of Red Sky, a company Laronde developed to bring her vision of Aboriginal performance to light, she’s taking Aboriginal performance to new heights. Over the years, she met writers like Tomson Highway and she saw many plays such as those of the Weesageechak Begins to Dance Festival. She began to develop ideas about Aboriginal theatre. She wanted the Aboriginal theatre scene to become more multi-dimensional. "I’m not interested in waiting for something to happen that may not happen in my lifetime, so I just have to go and do it," said Laronde. That’s how Red Sky came to be. Red Sky creates productions for general and family audiences. Laronde feels a need to stretch the boundaries of how Aboriginal theatre is conceived. "It’s about story, but Aboriginal theatrical expression is also about dance, music, and visual images. We need to push the boundaries of Aboriginal performance," said Laronde. On February 23, 2002, Red Sky produced its first production Caribou Song for the Toronto Symphony Orchestra’s Kids’ Klassics concert. The 70 musicians of the Toronto Symphony brought to life the sounds of 10,000 caribou as Laronde and Carlos Rivera danced in front of 5,000 people at Roy Thomson Hall. In 1999, his book hadn’t come out yet but Tomson Highway told Laronde about the book he had just finished writing. As he told her the story, he explained the rhythms he heard in Caribou Song, his first children’s book. Laronde asked Highway if Red Sky could conceptualize Caribou Song in another way for stage." It was a perfect story to lift off the page and put into the realm of dance, theatre, music and storytelling," said Laronde. Red Sky produced two versions of Caribou Song: a large orchestral version of 70 musicians and a chamber version of three musicians. "We designed Caribou Song to be portable so that it could tour remote and rural areas in Canada and around the world," said Laronde. Last year, Red Sky performed the chamber version in Winnipeg at the St. Norbert Arts Centre and in Switzerland at Murten Festival. "There are not enough of our stories out there. We don’t see ourselves reflected back to us, especially our experiences as children," said Laronde about the need to tell Aboriginal stories to the world. A future Red Sky project for young audiences is the adaptation of a traditional story, How Raven Stole the Sun. The story is designed for children 5 years and older and tells how Raven puts the sun, the moon and the stars in the sky. How Raven Stole the Sun is scheduled for presentation in 2003. Another scheduled date in 2003 is a Red Sky production tentatively titled Dancing Americas to be presented at the du Maurier Theatre in Toronto. Laronde described it as a "dance drama that brings Indigenous people together from North and South America." 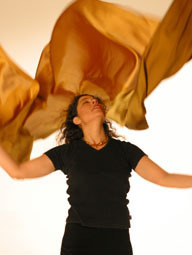 Laronde hopes to perform the piece with Carlos Rivera among others in Toronto and Mexico. Laronde recently worked as an actress playing "Emily Dictionary" on another project by Tomson Highway, the Cree author and playwright. Highway’s play the Rez Sisters packed full housed in Winnipeg at the Prairie Theatre Exchange for three weeks in March of this year. A Winnipeg journalist queried Laronde in an interview about the staying power of Rez Sisters, "This play’s been out since 1986. Don’t you think it’s time to start performing something new?" asked the reporter. She thought for a moment and replied, "How old is The Tempest or The Glass Menagerie? They’re still being performed. The Rez Sisters is our classic – an Aboriginal classic, and it’s going to be around for a long time to come". Laronde compared the works of playwrights to show how the search for identity is universal among them. "Hamlet looks for who he is by searching for his father. The Rez Sisters is like that in a way," Laronde said. "Their goal is to win at bingo, a simple enough goal, but this sends them off on a trip to Toronto. The come back changed, learning more about themselves and each other than when they left Wasy. Their sisterhood grows amongst them on their trip. That’s what Emily is looking for, a sense of sisterhood, being with people she knows. She realizes she doesn’t want to die alone on the highway like her lover did. That’s why she returned to Wasy. She didn’t want to die in the middle of nowhere. She wanted to die in the middle of somewhere; some place called home." Laronde grew up in Temagami and feels a familiarity to Highway’s knack for writing about life on the rez. He grew up on a reserve in Brochet, Manitoba where he spoke Cree as his first language. Laronde noticed Highway’s ability to capture the essence of rez humour. "The thing with Native people is that we tease those we care about. We tease those we like, and it is a form of affection," said Laronde. "Or teasing could be a way to put someone in their place. It’s a cultural way to tell someone that that isn’t the way to do something. The sisters can be so harsh in the way they speak to one another, but in the next moment they say something funny that washes away the harshness." Laronde has produced works of the Aboriginal artistic experience in different ways. In 1993, she founded Native Women in the Arts (NWIA). NWIA is an arts organization for First Nations, Metis and Inuit women from artistic disciplines who share the common interest of culture, art, community and the advancement of Indigenous peoples. NWIA works in literary arts and publishing, performing arts, visual arts, and community development projects. NWIA is a leader in publishing Aboriginal women’s work in Canada. Laronde constantly dreams about new projects that will represent the finest in the Aboriginal art world. As she opens doors to Aboriginal expression, we sit and wait for the magic to happen.